Show how much you like this site. Vote for us and help us move to the top of these lists. Settlers from many countries and many cultures contributed to the colorful Christmas customs shared by many Canadians today. Yet they have all come together to form some traditions that are uniquely Canadian. 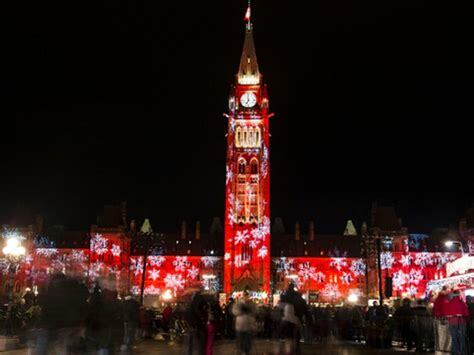 Since 1985, at 6:55 P.M. Ottawa-time in every province Christmas lights on every government building in Canada are turned on in a huge show of pomp and circumstance. Many of the ceremonies are repeated nightly until January 7 and may include caroling, performances by local performers and national celebrities, light shows, fireworks, and Christmas treats. While each ceremony may be similar in content each province adds its own cultural flare to the festivities. On Christmas Eve many Canadians attend church services. Churches of all sizes from the large cathedrals to the small-town churches offer the singing of the carols of Christmas, performances, and teachings on the meaning of Christmas. Bringing Christmas trees into the house for decorating was introduced to Canada by German immigrants in the late 1700s or mid-1800s. Now Canada is a major producer of Christmas producing about 6 million trees per year. Nova Scotia, the Christmas Tree Province, produces over 1.5 million trees each year for sale in eastern Canada and the United States. The province also ships Christmas trees to Central America, the Caribbean, and Venezuela. Every year a 70-foot tree is sent to Boston, Massachusetts in appreciation of the help sent to Halifax from Boston in 1917 when a ship with a full cargo of explosives exploded in Halifax Harbour killing 1,900 people and destroying much of the city. French Canadian immigrants began their Christmas preparations on the first Sunday of Advent. They would clean their houses, spruce up their barnyards, prepare their hearts and minds to celebrate the birth of the Christ Child, and cook lots and lots of food. Beef, pork, chicken, wild game, partridges, turkeys, and lots of doughnuts were prepared and stored for Reveillon, the big meal that followed the Christmas Eve midnight Mass. On Christmas Eve young children would hang up their stockings and go to be to rest up before the midnight Mass. The Christmas tree was then brought into the house and decorated with candles or lights, golden angels, and silver garlands. A nativity scene, or creche, many times homemade, was placed under the tree. Before time for midnight Mass the young children were wakened and the family would go to the church. Some women stayed home to prepare for Reveillon which followed the service. Reveillon often included la tourtiere, a meat pie, ragout de boulettes, a meatball and pork hocks stew, minced pork pie, partridge with cabbage, goose or turkey, les cretons, a pork spread, oyster or pea soup, homemade cheese sauces, head cheese, homemade ketchups, sweet pickles and relishes, chutney, and cranberry sauce. For dessert a variety of pastries and candies, bread pudding, corn meal cake, fruitcakes, sugar pie, maple syrup tarts, ice cream, and doughnuts, lots of doughnuts, were served. Eventually the buche de Noel joined the feast. It was a chocolate cake shaped like a log and topped with chocolate icing and made to look like a snow-covered log. This log replaced the Yule log that some families burned during Reveillon. Sometimes children may have received a few gifts during Reveillon, but the main gift-giving occurred on New Year's Day. Christmas Day was a day of relaxation for adults and a day of games and outdoor sports for children. On New Year's Day, after morning church services, families prepared for visitors and/or visited friends and family. They also exchanged gifts delivered to the family by either Pere Noel or the Infant Jesus. Today many French Canadians still attend midnight Mass on Christmas Eve and participate in winter sports on Christmas Day. Some still save their gift-giving for New Year's Day, but others give their children presents on both Christmas and New Year's Day. On New Year's Day many enjoy a lavish turkey dinner with family and/or friends. Before the mid-1800s Christmas trees were not used in British Canadian homes. Instead winter greenery, like hemlock, cedar, and spruce, were used to create wreaths, ropes and swags accented with cranberries, mountain ash, or strings of coral beads for decorating homes and churches. The main decoration was a kissing ball or kissing bunch made of evergreen boughs and decorated with candles, apples, and nuts. Like mistletoe, people caught under the kissing ball could be kissed. Early Irish Canadians also decorated their houses with small, handmade nativity scenes and candles in the windows. By the late 1800s Christmas celebrations included dinner parties, dances, christenings, engagement celebrations, and weddings. Decorations still included winter greenery but accented with red ribbons, popcorn chains, paper roses, and seasonal mottoes. Unwrapped Christmas presents for the children were placed on a table in the parlor on Christmas Eve to be exchanged on Christmas Day after morning church services. A great Christmas feast followed the exchange. Boxing Day, December 26, began as a day for tradesmen and delivery boys to receive gifts from those they served throughout the year. Well-to-do families would also give boxes of clothing and other goods to their servants and to those less fortunate. Today it is a national holiday marked by sales at stores and the exchanging "unwanted" gifts. Christmas cards were and are a favorite way for Canadians to keep in touch with friends and family who lived afar off. Christmas cards first appeared in Canada in 1876. In 1905, the Eaton's department store sponsored the first Santa Claus Parade in Toronto. The parade has grown in popularity and is now the largest Christmas parade in Canada. Because of the success of the Toronto parade other cities started having Christmas parades of their own. For years Canadians of all ages and especially British Canadians have spent Christmas afternoon either watching on TV or listening to the radio as the queen of England gives her annual message to the Commonwealth. The Christmas season ends for British Canadians on January 6 with the Feast of the Epiphany or Twelfth Night. A bean and a pea are baked into the Twelfth Night cake. The people who find them in their piece of cake become the king and queen of the night's festivities. When German immigrants landed on the shores of Canada in the 1700s and 1800s they brought with them Advent calendars, gingerbread houses, and Christmas trees. Most of them decorated their trees with cookies, sweets, and colorful decorations. The more well-to-do German Canadians purchased German-made glass ornaments in the shape of animals, fish, Santa Claus, moons, angels, musical instruments, and much more. They also hung Advent wreaths made of 4 candles placed in a circle of braided fir or pine boughs from the ceiling of their homes. On Christmas Eve some families opened gifts delivered by Santa Claus or the Christkindl (Christ Child). Their Christmas meal may have included turkey or roast goose, dumplings, red cabbage, hot cole slaw, carrot pudding (instead of plum pudding), lebkuchen (spicy cakes molded into various shapes), stolen (a fruit-filled bread), and a lot of Christmas cookies. The First Nations Peoples of Canada includes all groups of people who lived in what is now North America prior to colonization by the Europeans. Many of them held festivals during the winter season, such as winter solstice festivals featuring feasting, singing, dancing, drumming, racing competitions, and games of strength such as wrestling. Missionaries from the colonies taught these peoples the Christian Christmas customs they held dear. Many of the First Nations Peoples started celebrating Christmas also mixing the old winter festival customs with the Christmas traditions brought by the missionaries. Now many of the festivals include giving gifts and good things to children and to others. 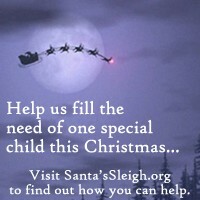 Even Santa Claus visits these people with gifts and merry making at their Christmas festivities. Immigrants from Ukraine first settled the plains of western Canada between 1892 and 1894. As they followed the Eastern Orthodox Church they celebrated Christmas Eve and Christmas Day on January 6 and 7. Some of their descendants have started celebrating a second Christmas on December 25. Gifts are not given on Christmas Eve or Christmas Day. Instead children receive their gifts on December 19, St. Nicholas Day, according to their calendar. On January 6, Christmas Eve, when a child sees the first star, representing the star of Bethlehem, of the evening, the Christmas feast, called Sviata VecheraI or Holy Supper, begins. It consists of 12 dishes symbolizing the 12 disciples and the 12 months of the year. No milk or meat is included in the ingredients of this meal. Under the tablecloth covering the table a bit of hay representing the manger where Jesus lay is placed. Christmas Day, January 7, is spent visiting friends, neighbors, and relatives. On January 19 the Christmas season ends with the Feast of Jordan followed by the Blessing the Water ceremony held at the Eastern Orthodox Church. Prior to the ceremony a second Sviata Vercheral is enjoyed. Once again the meal consists of 12 dishes none of which contain milk or meat products. Originally the Blessing the Water ceremony took place either in the churchyard or at the site on a river, lake, or well where the ice was cut. A cross made of ice was placed at the site. The priest would bless the water, and the parishioners would then take some of it home to be used to bless their families, livestock, and farm. Today the ceremony takes place at the church where the priest blesses a tub of water. Parishioners take some of the water to sprinkle on their homes. Canada's Christmas customs have come from a wide variety of cultures. They have given Canada a set of Christmas traditions unmatched anywhere in the world. Yet they still have formed their own set of national Christmas customs.